The Supreme Court in its historic ruling on 10 May 2011 held the 13th amendment of 1996 introducing the caretaker government prospectively void and unconstitutional. The ruling does not apply retrospectively to nullify past elections under the caretaker governments and next two elections may be held under the 13th amendment. This may be seen as contradictory. But it is a reality check and functional approach that judiciary adopts to avoid legal vacuum and maintain continuity in governmental authority without any abrupt break one of the four indispensable criteria of statehood. The arrangement is presumably a policy oriented breathing space, which may be necessary to amend the Constitution for an appropriate alternative arrangement. This stop-gap measure is no more than an option for Parliament, which is entitled to amend the Constitution anytime soon to avoid holding even the next election under the 13th amendment. Also former Appellate Division judges are not to be appointed as the chief Advisor of the caretaker government appears to be a reflection of keeping the apex judiciary at arm's length and immune from politics and the influence of incumbent governments, which is welcome. My purpose here is to reiterate the illegality of the 13th amendment, which I have been arguing since the very inception of the system in 1996 (Politics Administration and Change, No 26, December 1996, pp. 18-31; and Alauddin and Hasan eds, Development, Governance and the Environment in South Asia: A Focus on Bangladesh, Macmillan, London, 1999, ch 9). Holding free and fair elections is very desirable end in a rigged-election ravaged country. The idea of free and fair elections under a non-political caretaker government received its greatest momentum from past fraudulent elections. The purpose is intuitively appealing and exemplary for many third world countries like Bangladesh striving to restore public confidence in their election results. But this justified purpose cannot be achieved through unlawful means. The 13th amendment is illegal by what it provides and what it fails to provide. 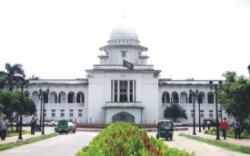 The writ petition's view that the 13th amendment defies the constitutional requirement that Bangladesh is a peoples' republic, which is to be governed by an elected government, is apparent. None of the members of the caretaker government, including the President, is elected but selected and absolutely unaccountable to the people, which compromises the representative democratic governance required in the Constitution. President is in charge of the caretaker government with the sole power to appoint and remove the chief adviser and other advisors. The chief advisor and other advisors may resign from their position to the President, who is the sole arbitrator of deciding whether the chief advisor and/or any other advisor is fit to continue in office. Although the executive power is required to be exercised by or on the authority of the chief advisor in accordance with the advice of the caretaker government (Art 58B3), in reality both the chief adviser and ten advisers hold office during the pleasure of , and are collectively responsible to, the President (Art 58B2). These are the common features of a presidential, not parliamentary, form of government, which is strikingly untenable in a parliamentary form of government under the Constitution. The 13th amendment has conferred some real and absolute powers on the President which are otherwise unavailable in the Constitution. In exercising these powers, the President is beyond the reach of the caretaker government and being not directly elected, not accountable to the people either. His/her only moral accountability lies to the political party that has appointed the President. Perhaps it is this element of unaccountability that led the recent past caretaker government to become self-serving, starting from the President's attempt to appoint himself as the chief advisor, functioning far beyond the 90-day tenure, and adopting many core policies and measures going far beyond the mandated “routine” functions in the act - all accomplished with impunity and under the emergency law. The 13th amendment thus transforms the figurehead President to an all-powerful President, effectively introducing an interim Presidential form of government with a team of advisors during the tenure of the caretaker government. It has created two separate but potentially conflicting sources of governmental power: the President and the caretaker government. These are affirmatively inconsistent with, and repugnant to, the basic structure of the Constitution. It is not necessary that the means of holding free and fair elections under a caretaker government be contrary to the Constitution. The means could well be based on a foundation of strict respect for the basic constitutional spirit and framework. The 13th amendment has sought to achieve a desired goal through unconstitutional means. The 13th amendment may work well if the President is also non-political like the advisors. But constitutionally a party in power is entitled to nominate and appoint a President of its own political persuasion in a bid to achieve political advantage through its loyal president. This had precisely happened on 18-20 May 1996, just three weeks prior to the general elections under the caretaker government. The President removed the Army Chief and two other senior military commanders arbitrarily, arrested and charged them with disobedience/mutiny/coup, and set up a military commission to try them, but subsequently dropped all charges and released them from custody without showing any reason. The President exercised the new power unilaterally without any consultation with or advice of the caretaker government. Articles 61 and 62 of the Constitution have made the President as the ceremonial commander in chief of the defence forces a power to be exercised on the advice of the Prime Minister pursuant to the practice of Westminster system of government. The 13th amendment has amended Article 61 affording the President to gain absolute control over the defence forces during the tenure of the caretaker government. This power of the President over armed forces has unconstitutionally deprived the caretaker government from an important portfolio, the defence services, which undermined the ability of the caretaker government in maintaining law and order at the time of elections. The President is neither a member of the caretaker government, nor is he/she a president under a presidential form of government. As such, the President cannot hold a portfolio. This new-found power of the President has a wider ramification in Bangladesh where unconstitutional means have often been the preferred mode of changing government. The 13th amendment is therefore far from being non-political and about a neutral caretaker government. It has introduced a non-party caretaker government subservient to an all-powerful President who may well be a political choice and appointee. As worked out, the caretaker government is for the President, of the President and by the President, who may well be a political choice of the party in power. The view that all parliamentary acts, being enacted by elected representatives, are as a matter of fact legitimate is based on the erroneous perception that our Parliament is sovereign law-making body like British Parliament. But unlike British Parliament, Bangladesh Parliament operates under a written constitution and its Article 7 prevents Parliament from enacting any law inconsistent with or repugnant to the Constitution. Being the custodian of the Constitution, the SC has judicial review power to declare any parliamentary act illegal to the extent of inconsistency with or repugnancy to the Constitution. Instances are not rare but numerous. It is quite common all over the world that under written constitutions apex judiciary exercise judicial review power, starting from Marbury v Madison (US SC 1803). The Bangladesh SC has exercised this power in Anwar Hossain Chowdhury case 1989 and recently in the 5th and 7th amendment cases. So far their constitutional consistency is concerned, there is no difference between the 5th, 7th, and 13th amendments. The SC has a duty to clean up the constitutional mess created by those amendments that serve sectarian interests, rendering the supreme law of the land incoherent and self-contradictory. This role of the SC may well be to the wonderment of those who benefited from this mess and view it controversial. But this is dignified constitutionalism, which must be respected. Notwithstanding the legitimate claim of its necessity raised and purpose it sought to protect, the caretaker government under the 13th amendment was unconstitutional ever since its enactment. Justified end does not justify prohibited means. Given the highly polarised political climate in Bangladesh, the need for devising appropriate means of holding free and fair elections cannot be gainsaid. But such means must be lawful and based on a foundation of respect for the basic constitutional spirit and structure. A sustainable constitutional order warrants a minimum standard of responsible political behaviour and culture to respect for the constitutional rule of law, which is not reflected in the 13th amendment. Legally, it falls far short of its constitutionality. Politically, it is a hasty and ill-thought out act of a besieged Parliament following the referendum of 15 September 1991. Even if it is conceded that the 13th amendment is an exceptional arrangement to address an extraordinary situation, exception does not necessarily represent the law and cannot be pleaded to exonerate Parliament from its constitutional obligation. The SC has belatedly reinforced this obligation. The author is Professor of Law, Macquarie University, Sydney, Australia.